Freshman women at Old Dominion University were given a very special welcome last week when they arrived on campus: Large banners that read “Rowdy and fun/Hope your baby girl is ready for a good time,” “Freshman daughter drop off,” and “Go ahead and drop off mom too.” Photos of the helpful offers to fornicate with women across multiple generations in the university community have since gone viral. “Messages like the ones displayed yesterday by a few students on the balcony of their private residence are not and will not [be] tolerated. The moment University staff became aware of these banners, they worked to have them removed. 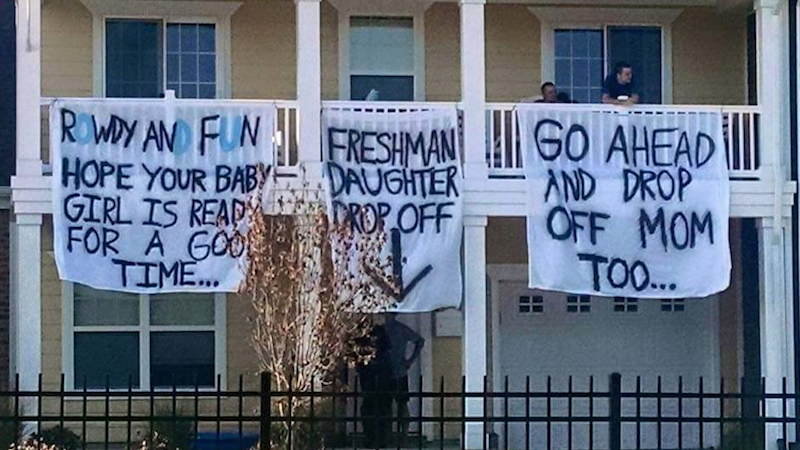 At ODU, we foster a community of respect and dignity, and these messages sickened us. They are not representative of our 3,000 faculty and staff, 25,000 students, and 130,000 alumni. Ours is a community that works actively to promote bystander intervention and takes a stand denouncing violence against women. The ‘It’s on Us’ video is just one example of ODU students’ leadership on this topic. Ellen Neufeldt, Vice President of Student Engagement and Enrollment Services signed her name to this statement. Sigma Nu Fraternity is investigating this matter, and based on what we know at this point, Fraternity members at ODU are not responsible for these offensive banners. While four members of the ODU chapter live in the building where the banners were displayed, initial information indicates individuals not associated with Sigma Nu Fraternity are responsible for the banners. Our investigation is continuing. On Saturday afternoon, spray paint that matched the signs was visible on the driveway of a house in the 1500 block of W. 43rd St., presumably where the paint bled through the banners. The house, across the street from campus, appeared to be the same one pictured in the photograph that circulated on the web. A man at the house Saturday who declined to be identified said the signs were never hung there. When a reporter pointed out the spray paint on the driveway, he admitted the signs were made there but insisted they were hung at a different house on the street. A half hour later, the wayward spray paint in the driveway was covered by plywood. Coleman’s original post inspired a thread of comments, including a response from the ODU Facebook account. One of the first people to share the photo, with the caption “Gotta love ODU,” was Norfolk police officer Ryan Shepherd. We’re currently awaiting statements from Sigma Nu Fraternity and ODU’s Interfraternity Council, and will keep you updated as things continue to develop. Top Image from Facebook. Embedded Images and Screengrabs from Instagram, Facebook, and Twitter.